The Woolworth Building, in Lower Manhattan, was completed in 1913. 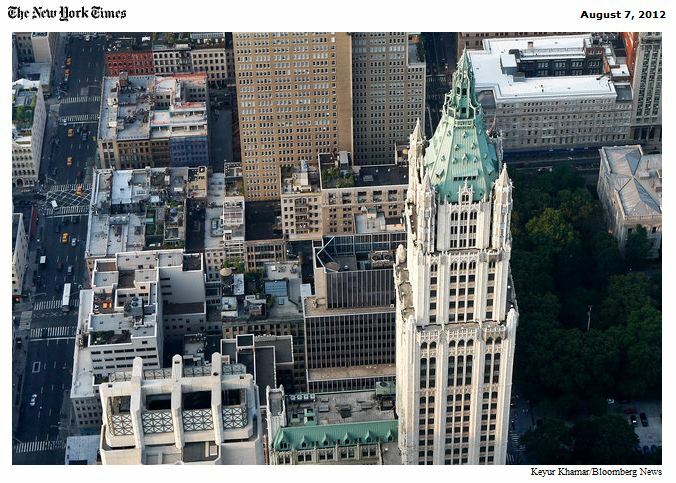 The Woolworth Building is about to have another defining moment. The uppermost floors of the neo-Gothic tower that once stood as the world’s tallest skyscraper will be turned into about 40 luxury apartments as part of a $68 million deal made final last week. Only if the Chrysler Building or Empire State Building were to be remade into condominiums could buyers hope to live in a more iconic New York tower. An investment group led by Alchemy Properties, a New York developer, bought the top 30 floors of the landmark on July 31 from the Witkoff Group and Cammeby’s International, which will continue to own the lower 28 floors and lease them as office space. The agreement promises to reinvent the tower — telescoping up at 233 Broadway between Park Place and Barclay Street — as one of Manhattan’s most sought-after addresses, adding yet another chapter to the history of this Cass Gilbert-designed monument to Frank W. Woolworth and his five-and-dime empire. The building, which cost Woolworth $13.5 million in cash, was completed in 1913 and remains a signature element of the city skyline. Apartments will begin at 350 feet above ground level, offering panoramic views with ceiling heights of 11 to 14 feet. The condos are expected to be completed by 2015. Penthouses in the building once called the “Cathedral of Commerce” will be among the highest-altitude residences in the city, soaring above 700 feet. A five-level penthouse of around 8,000 square feet will be housed in the copper-clad cupola that tops out at 792 feet. Originally designed as a public observation area, the cupola has a wraparound outdoor deck reached by a private elevator. An abandoned 55-foot-long basement swimming pool, once part of a health club said to be used by Woolworth himself, will be restored as an amenity for residents. A new entrance on Park Place will serve residents with an elevator bank separate from that used by office tenants in the lower floors. The trick to a successful conversion, he said, will be designing appropriately sized apartments for the downtown market despite the constraints imposed by the building’s infrastructure. The project will cost approximately $150 million, including its $68 million purchase price, according to a spokesman for Alchemy Properties. Although apartment prices have not been set, they may sell for as much as $3,000 a square foot. The penthouse at the pinnacle could command more. By comparison, the average price per square foot of apartments sold in the second quarter of 2012 in the Woolworth Building’s ZIP code — 10007 — was $1,250, according to data from Miller Samuel, a real estate appraisal and consulting firm. Mr. Gerringer described $2,000 a square foot as “the new normal for iconic buildings,” noting that the Woolworth tower apartments will begin on higher floors than most traditional prewar buildings. “You’re already raising the bar to begin with, ” he said. In 1998, the Witkoff Group and Cammeby’s International formed a partnership to buy the Woolworth Building for $126.5 million. They at one point considered remaking the tower as office space with country-club exclusivity. As part of that plan, the top 25 floors — each within the range of 3,500 to 8,000 square feet — were gutted. They have been vacant for several years. There has been much speculation over the years about potential buyers, ranging from Italian businessmen to an Israeli investor group. In the end, four serious buyers looked at the property, according to people familiar with the deal who asked not to be named. Nothing Alchemy has done quite compares with the challenge of transforming a signature piece of Manhattan real estate into residences, but the physical size of the project, at roughly 100,000 square feet, is similar to other developments the group has handled. “It’s our sweet spot,” Mr. Horn said. Alchemy has developed 30 properties in the New York metropolitan area, and most of its residential projects have been boutique buildings with just a few dozen apartments. Even owners of newer neighbors that tower over the Woolworth Building seem in awe of it. Bruce Ratner, the chairman of Forest City Ratner Companies, the developer of the 870-foot residential rental at 8 Spruce Street designed by Frank Gehry — currently the city’s tallest residential building — marveled at the view of its shorter neighbor from a penthouse window at the Gehry building recently.